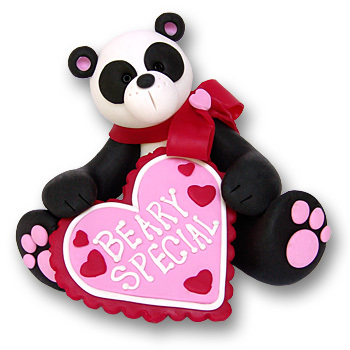 A very "Beary Special" Panda Bear for any collector. He makes a wonderful gift for Valentine's Day. As are all of our ornaments he is very detailed. Handmade from polymer clay, even the words are handcrafted from clay. This darling panda bear is a 3 sided figurine and is perfect as a mantel or shelf decoration. He does NOT have a hook for hanging and is not meant for personalization. Personalization in the photo is computer generated in order to show you where it will go. Actual personalization is hand done and although we do an exceptional job, it is done by a human and not a computer.